Whether you’ve got a small apartment or a box room in your home, making the most of these spaces can be a challenge. 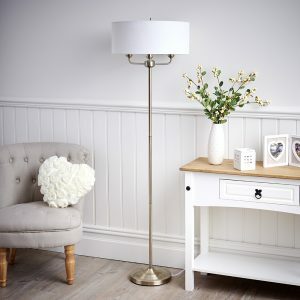 However, with a few simple decorating tricks, some strategic planning with your furniture and some clever storage solutions, you can maximise any small space. The key to getting it right is to consider the weight, scale and colour of the items you’re using. These can make a significant difference to how expansive a space feels. And even though new trends or traditional interior design ideas may seem like a good idea, they aren’t always the best solution when you’re decorating a small space. Some people avoid neutral palettes in fear they’re dull, lacklustre and boring – but when used correctly they can ooze sophistication and evoke a real sense of calm within your living space. Beiges, off-whites, light greys and creams are perfect for expanding a space. Plus, these softer hues will help reflect light, which also adds to the spaciousness of a room. Want to add your own creative stamp? Then you don’t have to restrict yourself to these light colours. Why not create a feature wall with some striped wallpaper? It’ll inject some colour into your home while also adding to the illusion of height within the room. Top tip: To accentuate a room’s brightness, try darkening the entranceway to the room. Adding this feature will help create an airy feel. Rooms often have many purposes. For example, your living room isn’t just a place where your family and friends gather, it might also be somewhere you have to work (and play). When a room’s small, it needs to accommodate a range of functions efficiently. Thankfully, there are a number of clever yet stylish ways you can do this. When you need extra seating, choose something that offers hidden storage, such as an ottoman. And continue this functional theme with your other furniture, opting for versatile pieces that have more than one purpose. This could be a low bookcase that serves as a room divider/console table, or a daybed that’s perfect for using as a sofa during the day but transforms into a bed for guests at night. Top tip: To add storage without taking up any floor space, opt for floating shelves. Not only can you use these to store books, accessories and so on, but you can also create funky displays. 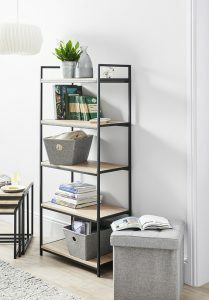 For example, books with their pages turned out add a contemporary twist to standard bookcases, while trays with drinks and glasses on are perfect for entertaining at night. One of the most well-known small home interior design tricks is to decorate with mirrors. Placed in strategic positions, they can make a room feel much larger while also creating a stunning focal point. Try to place them in a position where they’ll reflect a beautiful view or an eye-catching piece of artwork. You might also want to place artistic flower arrangements and candles near to the mirror, so these breathtaking features are duplicated without taking up any extra space. 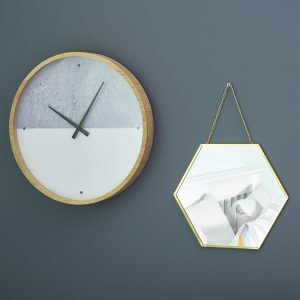 Top tip: To reflect even more light, add metallics in the form of accessories, picture frames and feature walls. As you’re looking for new pieces of furniture, consider how bulky they are visually. Chunky items that have a heavy appearance may constrict the space, which is why lightweight or see-through pieces are a much better option. These won’t obstruct your sight line, adding to the overall flow within the room. Round furniture is another must-have for making the most of spaces. The soft edges remove any harsh lines which can add to the cluttered, severe feel of a small space. Think round tables, sofas with soft corners and even bean bags you can place in the corner of a room. Top tip: If you can, leave a couple of inches between your furniture and the wall – this helps make the room look more spacious. A room that’s full of natural light will instantly feel more airy, so try to maximise how much light’s coming through your windows. You can do this by making sure your curtain poles are wider than the window so when your curtains are open they frame the window rather than concealing it. Opt for light fabrics in a similar neutral colour to your walls too. This will add to the fluidity of the space, preventing the room from looking cramped or overcrowded. Top tip: Crystals and glass are other materials that help to add further light to your room, reflecting the light beautifully. Consider crystal/glass lighting, glass doors and clear accessories. When you’re decorating your home, it can be tempting to splurge on new furniture, accessories, decor and finishing touches, but when you’re on a budget this soon makes the costs add up. Instead, try saving money on certain key pieces by using old furniture (or something you’ve found at the local car boot!) with new cushions and throws. If you’re going down the neutral route and want to introduce colour, a great way to do this is through accessories. Just choose your colour and pick up cushions, throws and rugs in the same shade. It’s a great way of injecting some spice and bold glamour into the room without removing the spacious feel of neutral colour schemes. Adding a bit of greenery and flowers to your home may seem as though you’re eating into some much-needed space, but plants are a great way of adding depth to your room. Softening the edges or corners of a room, plants won’t just bring an additional focal point to your home but they also help clean the air too! If you don’t have time to look after plants or you’re not very green fingered, at wilko we have a range of faux plants and flowers to choose from. Top tip: Ferns, cacti, succulents, aloe, orchids and other easy-to-care-for plants are perfect for small spaces. Armed with all of these home decor ideas for small homes you can get really creative with your living space. 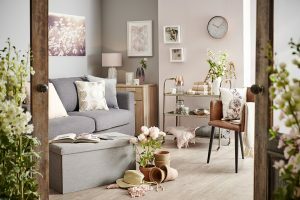 By being clever with key pieces of furniture, colour schemes and storage solutions you can transform your home without breaking the bank or cluttering up your small space.